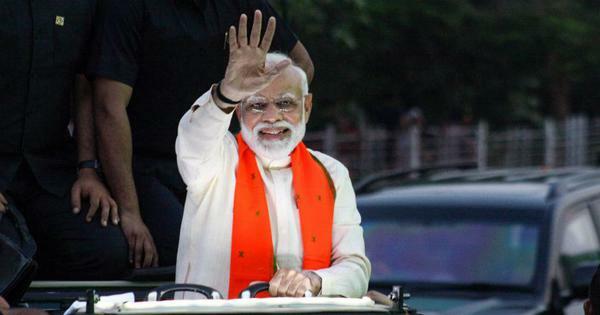 “A perception has been created that BJP is a North India party, a party of Hindi-speaking people,” Prime Minister Narendra Modi told BJP supporters at the party headquarters in Delhi on May 15, after votes had been counted in Karnataka. The BJP had emerged as the single-largest party in the state, although short of a majority. “The people of Karnataka have given a jolt to the people who have spread a negative perception about the BJP,” he said. The cover stories rolled out immediately: the victory in Karnataka engineered by Modi and BJP president Amit Shah had set dominoes in motion, and southern India, which seemed resistant to the BJP’s charms, was finally there for the taking. Days later, the narrative was upended. The BJP was trumped by an alliance of runners-up in Karnataka, keeping the party out of power in the five big southern states. Its failure to form the government in Karnataka does not erase the big gains the BJP made in the state. But the South remains a challenge for the party that is rolling through the rest of the country. 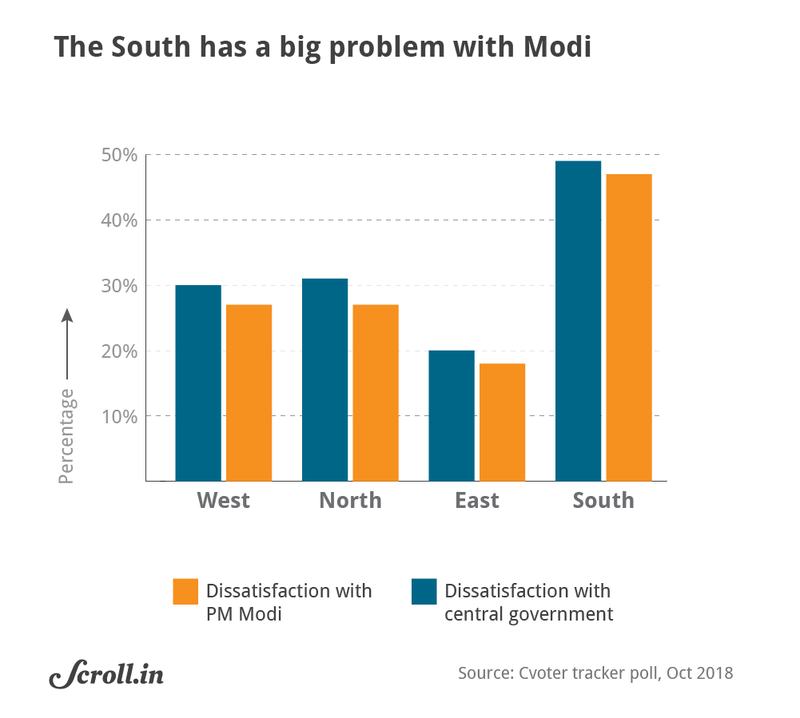 New opinion polls confirm this “North-South divide” – India’s southern states have far greater antipathy to the central government and to Modi than does the rest of the country, and the 2019 Lok Sabha elections aren’t far away. 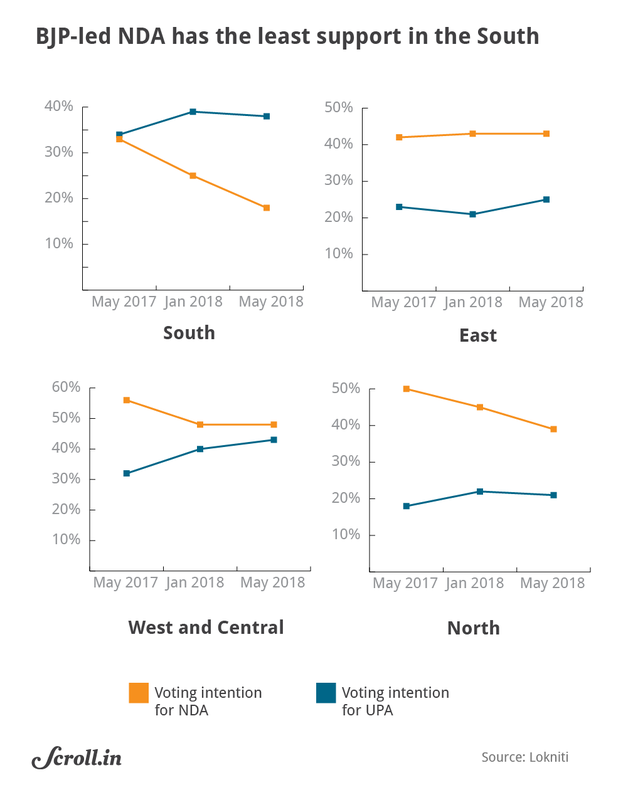 Between May 2017 and May 2018, the Lokniti programme at the Centre for the Study of Developing Societies conducted three opinion polls on a nationally representative sample. 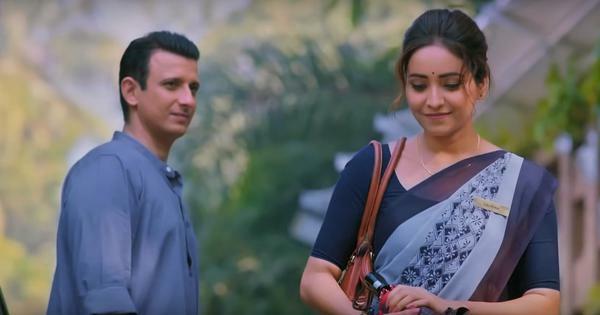 They found that South India was the only part of the country that systematically chose the Congress-led United Progressive Alliance over the BJP-led National Democratic Alliance, and that the gap was widening. The South is not a monolith, of course, and the stories of the five states differ significantly. The BJP is the principal opposition in Karnataka and has formed government twice – backing the Janata Dal (Secular) in a coalition from 2006 to 2008, and then ruling the state on its own from 2008 to 2013. 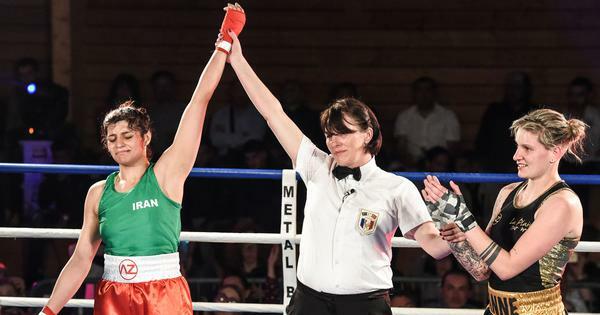 The BJP fell short of a majority in the 2018 election but was the single largest party, and is projected to do well in the state in the 2019 Lok Sabha elections. The polling agency CVoter estimated that the NDA would win 18 of the state’s 28 seats if elections were held in October 2018. 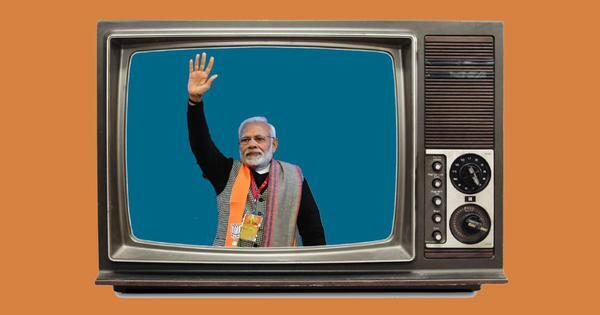 In Kerala, where the BJP has focused its attention, resources, manpower and media power, there is a clear BJP voter. But the voteshare of about 10% has not yet translated into a large number of seats. The fight remains between the Congress and the Left, and CVoter projects no seats in 2019 for the BJP. In the remaining three states, the BJP does not stand a chance without allies. In Andhra Pradesh and Telangana, the BJP has a presence, with four MLAs in Andhra Pradesh which it ruled until recently with pre-poll ally the Telugu Desam Party, and five MLAs in Telangana. But regional parties remain dominant in both the states. CVoter estimated 20 of 25 seats in Andhra Pradesh for the YSR Congress with the remaining going to the BJP’s former ally, the TDP. In Telangana, CVoter projects an even fight between the UPA and the Telangana Rashtra Samithi, with the BJP on the sidelines. 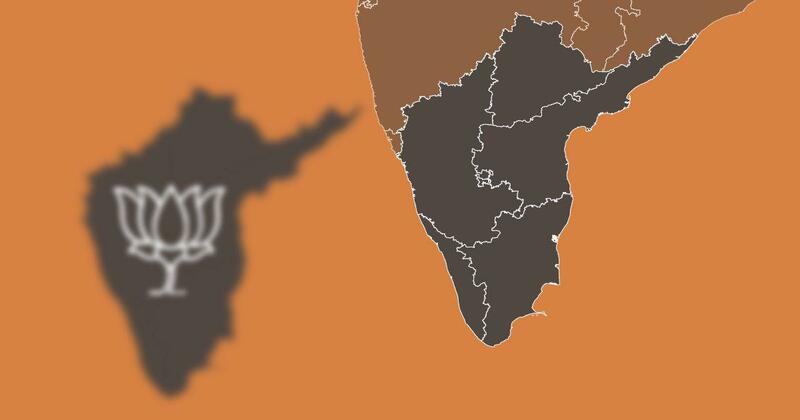 Tamil Nadu has arguably the weakest BJP foothold of any state in the country. 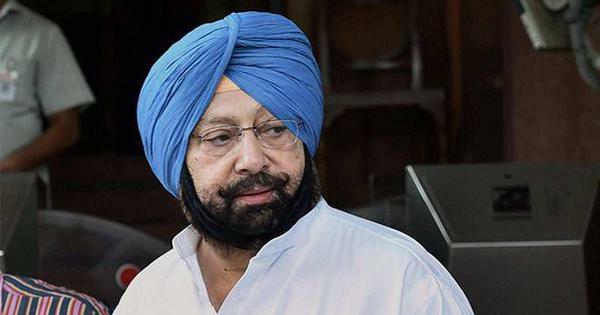 The party won one seat in the 2014 Lok Sabha election with a tiny voteshare, but in the state’s 2016 assembly election, the BJP was washed out. 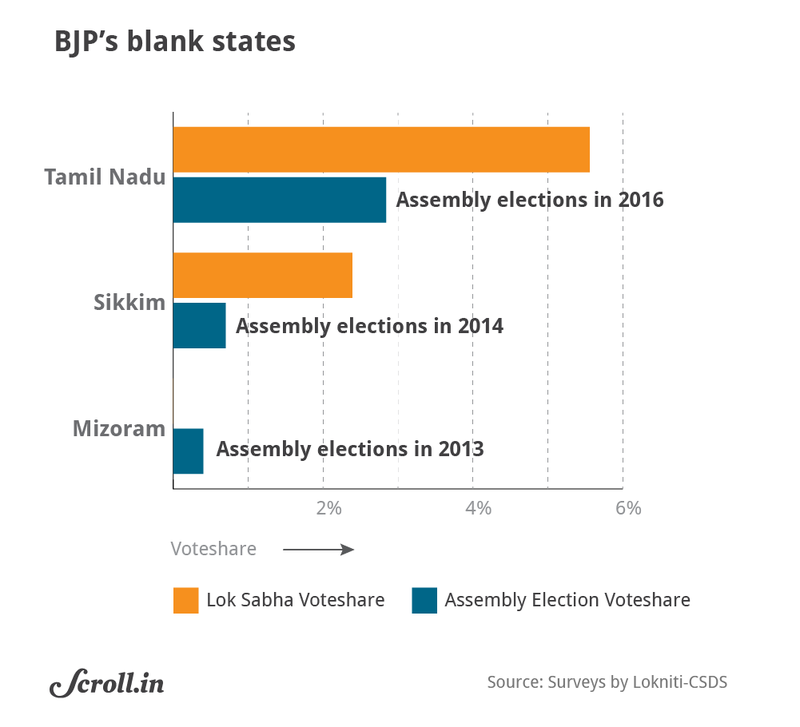 There are now only three state assemblies with no BJP MLA – Sikkim, where the ruling party is an NDA ally at the centre, Mizoram, which is due for elections later this month, and Tamil Nadu. Of these, only Tamil Nadu had its assembly election after the 2014 Lok Sabha elections. In opinion polls as well, Tamil Nadu stands out in its opposition to the BJP and to Modi. Of all the states polled by Lokniti, dissatisfaction with the Modi government was the highest in Tamil Nadu – three-quarters of those polled said they were dissatisfied with the Modi government as against just 29% in Bihar. What the BJP does not seem to have cracked in the South as it has in the North East is the issue of identity and self-respect. The BJP remains closely associated with Hindi and the Hindi heartland. In 2014, the party did much better among Hindi speakers, the journalist Roshan Kishore writing for Mint newspaper found. Since then, the party has aggressively pursued the promotion of Hindi. While it successfully overcame this image for its wins in the North East, in the South it has found itself on the wrong side of public opinion on many key issues – the jallikattu protests in Tamil Nadu, both beef and floods in Kerala, and the issue of special status for Andhra Pradesh, among others. 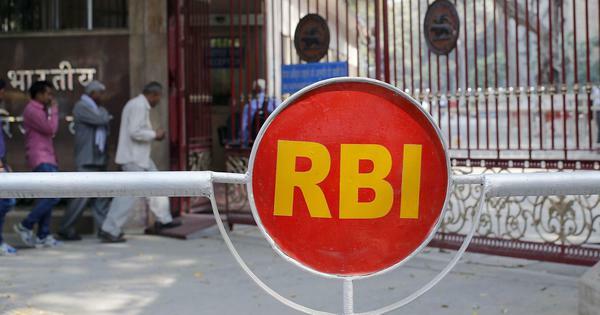 Data from the multi-year large-scale Lok Foundation-Oxford University surveys administered by the Centre for the Monitoring of the Indian Economy shows that some of the southern states – Tamil Nadu and Andhra Pradesh in particular – feel strongly that their state is disrespected by the BJP. But on one recent issue, the BJP appears to have done its homework well. The party is unabashedly stoking the protests in Kerala against the entry of women to the Sabarimala shrine, and opinion polling data from CVoter’s State Of The Nation poll indicates that it is paying dividends. 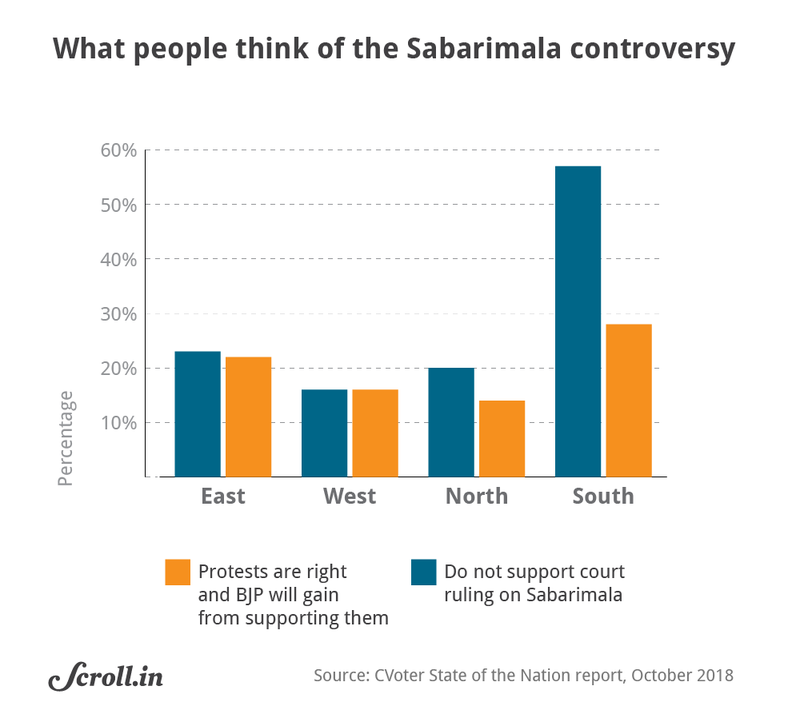 Asked about the Sabarimala controversy last month, a majority in the southern states opposed the Supreme Court’s ruling, while the rest of the country supported it. Far more in the South than elsewhere supported the BJP’s backing of the protests. The effort and strategising that the BJP is putting into its southern attempts, and the role of religious appeal in it has been laid bare. For now, it seems unlikely to translate into votes, but the effect on the electorate for the future is less easy to quantify. How India Votes: Does the BJP need allies in 2019 or do allies need the BJP?